Dr. Sutter is a Washington native who earned his bachelor’s degree from the University of Washington, and his DDS degree from the UW School of Dentistry. 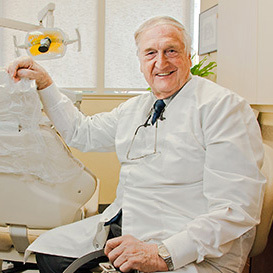 Besides his continuing education and extensive experience in all areas of general dentistry, he has had specialty training in gnathology, the study and treatment of the physiology and functioning of oral occlusion (the way sets of teeth meet and function during biting and chewing). Dr. Sutter, a Navy veteran, loves the ocean and boating. He has been active in community matters, including being a member of the First Hill Improvement Club, and helping to found Seattle’s Medic One program.